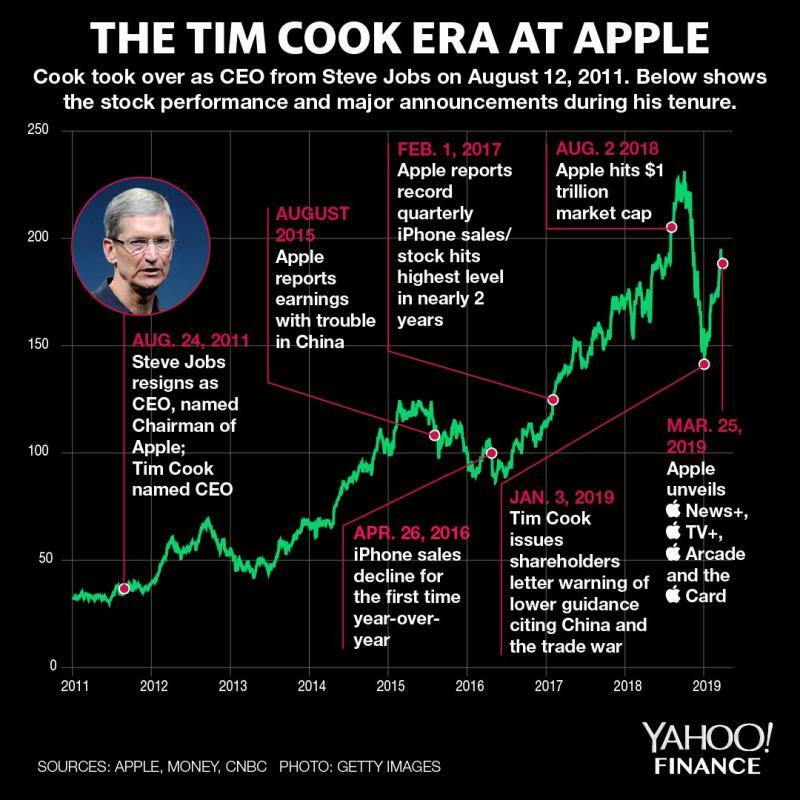 If price is truth in the stock market, then investors just sent Apple (AAPL) CEO Tim Cook and his entire management team a loud message following one overhyped event at Steve Jobs Theater on Monday. The message: a collective yawn. Cook strode to the stage and slapped hands with Hollywood stars like Steven Spielberg and Oprah Winfrey to get the world excited about a new video streaming service (that apparently is free because Apple didn’t reveal the price) that may challenge Netflix and Disney. Apple took the wraps off a news subscription service that has a price, $9.99 a month. The Wall Street Journal quickly rejoiced, saying it will partner with Apple and is hiring journalists to get content on the platform. And the icing on the cake: a titanium card that will be known as Apple Card, the tech giant’s foray into lending with Goldman Sachs. Goldman CEO David Solomon told staffers the card will be game-changing mostly because of its low interest rate (which was also not disclosed). Instagram influencers are undoubtedly dying to get their hands on this piece of Apple titanium. Apple shares finished Monday’s session down 1.2%. In doing so, the stock broke a key resistance point that could set the stage for more near-term profit-taking. After a nice rally in the lead up to the event, Apple shares finally broke through its 200-day moving average for two sessions last week. The stock — which is still down some 20% from its October 2018 peak — had traded under its 200-day moving average for about four months before those two sessions. That movement was bullish for Apple, of course, especially alongside a broader stock market coming under pressure again. Apple's big event let investors down, bottom line. But, the stock fell below the key 200-day moving average on Monday in a sign investors don’t believe Apple’s new services will move the profit needle for at least several quarters. Some on Wall Street wonder if building out the businesses won’t pressure Apple’s bottom line even more at a time of weak smartphone sales. “We see limited pricing power given the small content library at launch, and if Apple is playing the long game here it could pressure financials for years. The $9.99 per month Apple News+ service seems compelling but the limited geographic rollout likely constrains its impact,” said Jefferies analyst Tim O’Shea. Hardly a vote of confidence, but one echoed by many on Wall Street in the hours after Cook & Co. exited the stage. With the services reveal party out of the way with no great fanfare, Apple investors will probably return their focus to sluggish smartphone demand and fears on a lack of hardware innovation. In turn, the rally in Apple’s stock (up about 10% over the last month) could have just ended. “Without iPhone demand acceleration, we currently do not see near-term catalysts to drive EPS upside to support the valuation rally,” Longbow tech analyst Shawn Harrison contended. Sometimes the charts don’t lie.